Recent News - Reynoldsburg, Ohio – GPAX, INC.
Vernon Hills, Illinois and Columbus, Ohio USA ............A joint announcement was made at APEX2000 that Fuji; the worlds largest SMT equipment supplier will incorporate GPAX spliceable tape and reel technology into their latest placement equipment. The GPAX mechanically interlocking, spliceable tapes are used industry-wide to package a wide variety of both through-hole and SMT odd form parts. Carrier tapes are EIA standard and are available from 44mm to 200mm which facilitate taping of the smallest odd form to the longest connectors. The tape technology is used to package and feed even the most difficult to automate odd form parts. "Fuji's firmware has been designed to handle multiple parts per pitch. With reel diameters of 610mm and spliceable tapes, this offers the OEM or EMSI large line inventories which keeps equipment running at its' highest efficiency. Throughput is maximized and so are their profits," said Bill Mahoney, Vice President Marketing for GPAX. Carrier tape costs are comparatively low as a result of the unique multiple parts per pitch capability of the GPAX tapes. Parts are acquired using vacuum nozzles. Fewer feeder slots are used because there are no space consuming glue or seal-strips or deep draft angles required when using GPAX ThruPAX (through-hole) and Semi-Pocket carrier. "We are very pleased to introduce the GPAX tape technology on our newest equipment," said Mr. Tatsuo Yoshida, Director SMT Equipment Design of Fuji machines. "This increases the capabilities of our equipment while enhancing performance". GPAX, Ltd is a manufacturer of component packaging and feeding products in tape and reel format for use in small parts assembly automation. With headquarters located in Columbus, Ohio, USA, GPAX markets its products worldwide to OEM and EMSI and component manufacturers. Fuji America Corporation, a subsidiary of Fuji Machine Manufacturing Co., Ltd., of Chiryu, Japan, was established in 1970 and has become a leading manufacturer of high-performance, high-volume equipment for SMT assembly of printed circuit boards. Fuji America is headquartered in Vernon Hills, Illinois and has over 130 employees. GPAX, Ltd....................................................................... Columbus, Ohio announced a new version of their ThruPAX Flat Carrier that now allows vacuum nozzles and parallel jaw grippers to acquire through-hole parts. The pre-punched lead holes in the flat GPAX polyester carrier are precisely punched slightly larger than the part lead diameter. This maintains component lead pattern registration in the carrier tape, and results in zero retention force so that parts can be acquired with vacuum nozzles or parallel jaw grippers and placed directly on the PCB without using vision. This vacuum capability is of particular importance in high density PCB assembly where parts such as relays and transformers are "brickwalled" next to each other and grippers can not be used. The GPAX tape packaging and delivery method is extremely cost effective compared to tubes and full pocket tapes feeding only one part per pitch. The GPAX EIA standard format includes multiple parts per row on a 610mm diameter supply reel offering over 3,000 parts of line inventory on one feeder with spliceable tapes. The carrier is punched - not thermoformed as are tubes or full pocket carrier – and with formats of 4 parts per pitch or more, the flat carrier tape is produced and used at very low cost. Bill Mahoney, Vice President, Marketing says, "These LE tapes offer maximized throughput and reduced cycle times with multiple vacuum head placement equipment. With large line inventories and virtually no downtime for splicing tapes, equipment utilization is optimized and throughputmaximized. We have a high volume installation at one of the worlds largest contract manufacturers placing odd form through-hole parts on GPAX at a placement rate of under 0.9 seconds per part, continuously!" With placement cycle times of through-hole parts approaching those of SMT, the cost model to automate odd form parts is now significantly more attractive. Taping the parts is much lower cost too. Unpopulated supply reels (610mm) of flat pre-punched carrier are dense and contain enough carrier to package up to 48,000 parts. This results in about 47 fewer reel changes compared to full pocket carrier. GPAX carrier is then staple spliced leader to trailer on the taping machine providing maximized uptime of taping equipment, particularly when automated. Since 610mm output reels carry 3,000 parts or more, as opposed to small and costly plastic reels with perhaps 400 parts per reel, the math model shows GPAX is significantly lower cost to use. "It's really straight forward", says Bill, "The end-user gets an EIA standard proven tape package at a very low cost, lots of line inventory, better asset utilization with maximized throughput. We have real life basedcost models to prove it – to get a copy, email WA_Mahoney@gpax.com." GPAX feeders are distributed directly through the placement equipment OEM and mount on virtually all equipment handling odd form parts. GPAX, Ltd is a manufacturer of component packaging and feeding products in tape and reel format for use in electronic and mechanical assembly automation. With headquarters located in Columbus, Ohio, USA, GPAX markets its products worldwide to users, OEM’s and component manufacturers through a direct sales force, a network of assembly systems integrators, and appointed distributors and representatives. Parts As Thin As 0.2mm Can Now Be Taped And FedIn Standard OEM SMT Feeders With Protected Coplanarity. management released today an innovative design of interlocking cover and embossed carrier tape used to package very thin parts such as metal stampings and flex circuits, while protecting their integrity and coplanarity in the package. The design uses tabs in the cover tape, which "snap" into and are retained by corresponding receiver pockets in the carrier. Vertical movement of the part in the pocket is controlled preventing the thin parts from bouncing and shingling between pockets and also between the side of the carrier and cover. William A. Mahoney, Vice President, Marketing for GPAX, Ltd said, "Automatic feeding very thin parts has been quite a problem for some time and required the use of special and custom feeders. Now, users can reliably feed these parts in pockets using standard OEM feeders." The package is even more cost effective when the GPAX UltraFlex Feeder is used because several thin parts can be stacked in the same pocket with the feeder sensing removal of the last part, then indexing to the next pocket. 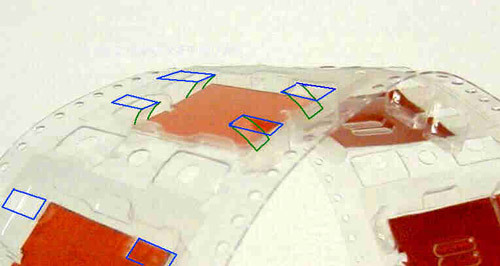 The GPAX mechanically interlocking spliceable tape concept is maintained. GPAX tapes are made in accordance with EIA standards in widths from 44mm to 152mm. GPAX, Ltd is a manufacturer of component packaging and feeding products in tape and reel format for use in small parts assembly automation. With headquarters located in Columbus, Ohio, USA, GPAX markets its products worldwide to users and component manufacturers through a direct sales force, a network of assembly systems integrators, and appointed distributors and representatives. and represented by Transtechnology, introduces its tape and reel process for small parts assembly. GPAX tapes are comprised of a two part mechanically interlocking carrier and StitchLockä cover, made in accordance with EIA 481 standards, and available in widths from 44mm to 152mm. The robust mechanical interlock is unaffected by heat or humidity. The tapes are made of PET and are recyclable. Numerous companies are packaging on GPAX in Asia which include AMP, CTS, DDK, Hon Hai (Foxconn), Kyocera, Matsushita, Molex, NEC, Northern Telecom, Omron, Takamizawa, specifically in Singapore, Taiwan, Thialand, Japan, and Penang. GPAX has established other similar capabilities in the United States. Some of the GPAX users include Allen-Bradley, AT & T, Ford, General Motors, Hewlett-Packard, IBM, and Motorola. Types of parts packaged on GPAX for small parts assembly include a wide range of both electronic and mechanical components such as connectors, relays, hybrids, springs, valves and magnets. The parts can be either through hole or surface mount. SMT parts are typically packaged in GPAX Semi-Pocket carrier, which received the Vision Award at the Surface Mount International Expo in San Jose, California. GPAX 2100 UltraFlex Feeders are easily installed on robotic placement equipment such as Adept, Seiko and others. GPAX feeders are compatible with other placement devices such as Yamaha, Universal GSM-1, OFP-1, Zevatech Cat 1200. GPAX, Ltd is a manufacturer of component packaging and feeding products in tape and reel format for use in small parts assembly automation, with headquarters located in Columbus, Ohio, USA, GPAX markets its products worldwide to users and component manufacturers through a direct sales force, a network of assembly systems integrators, and appointed distributors and representatives. Mechanically interlocking tapes are aplicable, low cost and minimize waste. announced that its' taping technology for SMT and THT odd forms is now an Electronic Industries Association (EIA) standard. The standard is available as EIA IS/704. The mechanically interlocking tapes connect to each other with a series of tabs at intervals across the width of the carrier - heat or adhesives are not used and "peel force" issues are completely eliminated. The tapes are mechanically separated on the feeder exposing only one row of parts for automatic picking. Multiple parts per row provide substantial line inventory. At the end of a supply reel the tapes are staple spliced "on-the-fly". This offers continuous uninterrupted production and improves line thru-put resulting from fewer reel changes and less equipment downtime. William Mahoney, VP Marketing stated, "GPAX is a member of the EIA Automated Component Handling (ACH) Committee and is an original sponsor of the new wide carrier [from 72mm to 200mm] standard. We have worked several years toward the development of this standard because our customers were demanding it." "As tape packages are standardized the larger volume usage will bring down costs significantly. This is about the same place SMT was 10 years ago", said Mahoney. Other international standards organization such as EIAJ and IEC will soon be initiating work projects for similar tape standards. It is expected that much of the work done by EIA-ACH will be incorporated in their development. "GPAX has established its leadership position utilizing wide carrier tapes for odd forms by concentrating on providing solutions as opposed to products. We work closely with placement equipment and taping equipment manufacturers to assure compatibility so that the end user customer has a "plug and play", low cost, high quality solution", said the Marketing VP. GPAX(R) International, Inc. is a manufacturer of component packaging and feeding products in tape and reel format for use in small parts assembly automation. With headquarters located in Columbus, Ohio, USA, GPAX markets its products worldwide to users and component manufacturers through a direct sales force, a network of assembly systems integrators, and appointed distributors and representatives. NEW MECHANICALLY INTERLOCKING FLAT COVER TAPE FOR OEM FEEDERS. No Variability in Tape Interlock Force, No Peel Force Testing, and No Cover Tape Tearing or Stretching. Compatibility with Standard OEM EIA Tape Feeders such as Universal, Fuji, Hover-Davis, Panasonic and others. Columbus, Ohio USA ........................................................... GPAX, Ltd introduced a new FLAT version of its unique mechanically interlocking StitchLock(TM) cover tape, called FlatPAX(TM). William Mahoney, VP of Marketing for GPAX stated, "Our customers have been asking us to provide a total component package inclusive of both carrier and cover tape to be compatible with their existing installed base of standard OEM SMT platforms and feeders. Proven on the factory floor, GPAX tape and reel technology will enhance the productivity of these platforms using the reel to reel tape splicing capability of the GPAX tapes. Splicing offers less equipment downtime and increased through-put." GPAX provides at no charge a stationary wedge-like device to separate the cover tape on the OEM feeder. The feeder can then feed both GPAX and other types of cover tape with no changeover or feeder modification required. This concept is proven functional at production rates using Fuji, Hover-Davis, Panasonic and Universal Instruments tape and reel feeders. 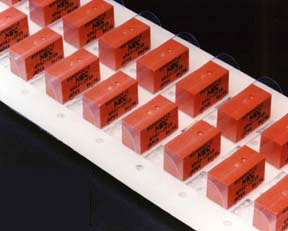 The mechanically interlocking cover tape offers rapid packaging rates at the component vendor. It is a robust package eliminating peel force testing, variability in tape adhesion force, and tearing or stretching of cover tapes. And, because carrier and cover tapes are spliced on the taping equipment there is virtually no scrap and no downtime to purge the equipment and replenish supply reels. This is particularly important on fully automated taping equipment. The results are decreased costs and increased through-put. The FlatPAX cover has been under evaluation at several key manufacturing sites and is now commercially available. Management announced today they have been awarded a $500,000 contract for the equipment to package and feed all relays, hybrids and transformers for Northern Telecom's automated manufacturing line in Research Triangle Park, N.C. Northern Telecom uses several component vendors to manufacture its central office switching systems. Their vendors will package components directly from production using the patented GPAX tape and reel format. Most of the packaging will be fully automated, therefore achieving the lowest possible cost. "With the specification and practice of this small parts packaging and feeding process by multinational companies and the ready acceptance of packaging directly by the component manufacturers, we expect GPAX will emerge as an international standard," commented Bill Mahoney, V.P. Marketing, GPAX, Ltd. "The GPAX taping method provides distinct advantages over the current stick/tube and tray packaging methods we employ," said Pete Owens, project engineer, Northern Telecom. "Specifically, the precision punched carrier tape, the essence of the GPAX technology, and the GPAX smart feeder systems provide a component presentation method unequaled in accuracy and repeatability." Packaging components in GPAX at the suppliers facility puts the burden of component lead quality back into the lap of the supplier and not on the assembler, where each rejected component represents lost assembly time and reduced throughput. Older packaging technology requires an additional step to register and orient the component before automatic assembly. The GPAX tape takes this secondary step out of the process. This represents a four second, or a 50 percent cycle time reduction for each component fed from GPAX tape. To date, five of Northern Telecom's top component suppliers have agreed to provide their products in the GPAX tape format. 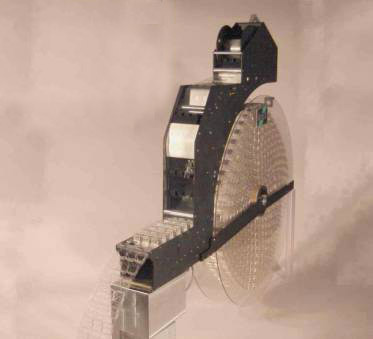 The GPAX process consists of the placement of through-hole and surface mount odd-form components, both mechanical and electrical, onto a pre-punched carrier tape. Utilizing a GPAX 4000 Loader (packaging machine), the components are then secured onto the carrier tape with a mechanically interlocking StitchLock cover tape and wound onto reels which can be stored in large reserve for continuous on-line inventory. The reels maintain the components within a .001 in (.025 mm) degree of registration; thus all packaged parts are 100% auto-insertable. The GPAX 2000 Dispenser then presents the registered components into the work cell. GPAX, Ltd has been in existence for three and a half years and has already exceeded 5.5 Sigma performance with its GPAX 2000 Dispensers. Prominent GPAX customers, such as Chrysler, Ford Electronics, Ford Transmission and Chassis, General Dynamics, Hewlett-Packard, IBM, Motorola, and Northern Telecom are using the GPAX tape and reel process in high volume production." At GPAX, we strive for the highest level of quality and excellence in our production standards," said Mahoney. "This means built-in cost savings to our customers by assuring component quality and integrity with each auto insertion." Northern Telecom is the leading global supplier of fully digital telecommunications switching systems, providing products and services to telephone operating companies, corporations, governments, universities and other institutions worldwide. Northern Telecom, with 1989 revenues of $6.1 billion, employs more than 49,000 people around the world. GPAX, Ltd is a manufacturer of component packaging and dispensing (feeding) products in tape and reel format for use in small parts assembly automation. With headquarters located in Columbus, Ohio, GPAX markets its products worldwide to users and component manufacturers through a direct sales force and a network of assembly systems integrators. Announces the completion of and installation of several fully automated GPAX 4008 Loaders for high speed packaging of connectors for Northern Telecom in Lachine, Quebec Canada. The integration was accomplished by ATS of Simi Valley, California. This links the process of packaging odd-form connectors from the final production of the component directly onto GPAX's EIA standard carrier tape. The carrier is prepunched with the component lead pattern. The leads of the component are inserted into the prepunched holes registering the component lead pattern to within 0.001". Mr. Dominic Savo, General Manager of ATS says, "GPAX is the best automation tape and reel process I know. We were very pleased with the results and exceeded Northern Telecom's expectations. I think GPAX should be accepted as a standard by the Electronic Industries Association." High speed automated packaging significantly reduces the cost of packaging components on tape-and-reel format and thereby sets the cost lower than that of the price of tubes. Components taped on GPAX provide an ample supply of on-line inventory requiring less replenishment compared to tubes. When a reel is nearly depleted, another can easily be staple spliced onto the next reel without having to shut down the feeder. Thus, further absorbing costs and time is cut from the total automation process for the end user's benefit. William A. Mahoney, Vice President of Sales and Marketing at GPAX stated, "At Northern Telecom, this connector was the latest of many components to be packaged and fed on GPAX. Now all of the odd-form components on the line are fully automated at the lowest cost and fed on GPAX mechanically interlocking tape technology." ATS is a manufacturer of custom automated assembly machines and material handling equipment. ATS headquarters are located in Cambridge Ontario, Canada with other manufacturing facilities in Columbus, Ohio, Livermore, California and Corvallis, Oregon. GPAX, Ltd is a manufacturer of component packing and dispensing (feeding) products in tape and reel format for use in small parts assembly automation. With headquarters located in Columbus, Ohio. GPAX markets its products worldwide to users and component manufacturers through a direct sales force and a network of assembly systems integrators.